You are here: Home / Architects / Modern House – Friendly Neighbor? Modern House – Friendly Neighbor? There is a new project by my office and as I have been watching it go up, it has made me think about architects + modern houses and if together they have any responsibility to the neighborhood where they get built. This project is by award winning local architect Russell Buchanan, who started his firm in 1992 after stints working for HKS and Cunningham Architects. There are a few disclaimers I should get out of the way; I don’t really know Russell, we have met a few times but we have never engaged in a manner where I think he would remember me (although you can’t live in Dallas and not know of me, Yeah! *Air Punch*). I respect his work and I am a fan – usually. I have been through several of his projects and you can’t help but notice and appreciate his meticulous detailing. It is also fair to say that there are aspects of his work that I try to emulate in my own. The plans are extremely well resolved and he typically designs on a building material module (16″, 32″ 48″, etc. ), which trust me, isn’t as easy as it sounds. Because of all these things, I am going to give him the benefit of the doubt at this stage because it’s not complete and I don’t know what’s coming (if anything – this would include possible skins/ screens and landscaping). What I am interested in discussing now is if this house, or architects in general, have a responsibility to the surrounding environment where our projects are located? This house site on a lot that is 50′ x 247′ within the city of Highland Park. This is a very expensive neighborhood and this particular lot was appraised by the city in 2010 at $617,500 (that’s just for the lot. Click here for Google maps link for additional adjacent context – in the aerial view, the lot shows up scrapped but in the street view, there is a green colored house still shown on the lot). By comparison, the house shown in the above picture just to the left has an appraised value $695,690 ($78,190 for the house and $617,500 for the lot). That neighbor has owned his house since 2001 when the overall appraised value was set at $358,410. It is not uncommon here that as land values go up, the value of the house goes down to keep the overall value within a state law that limits raising the property taxes more than 10% a year. When you look at this modern style house, what comes to mind? Are you thinking as a designer and critically evaluating it? I know that’s hard to do since I haven’t given you any information other than a front elevation. Just based on that, it looks like a realized form of a parti-diagram or initial concept/ massing model that got built. What you can see and evaluate is it’s scale, the materials it uses, the relationship between public and private, and its perceived scale to the neighborhood. I should point out that the lots on this street have alley access for vehicles – so the owners never have to walk out the front door except to get the newspaper. Right now there are some supports under the “open space” in the bottom left corner of the front mass – those will go away because as I understand it from seeing the construction, that piece is cantilevered out which is part of the reason I am not passing judgement yet. What’s going to happen there? Okay – now think about those same items but put yourself in the shoes of the guy who owns the property to the left. How do you think he feels? Is this good for him and his property value? Should you care about that guy? What if he was counting on retiring on the balance between the appraised value in 2001 and 2010 of $337,280 he had hoped to get from the future sale of his home? We know from the appraisal district that his land is worth almost 8x what his house is valued at – is the inevitable irrelevancy and eminent demolition of his home all but assured now? Is it our job as architects to care about that guy? Would this be a different conversation if this modern project was sitting on a piece of land that allowed the house to be as intrinsic as it clearly wants to be? Is this about providing lodging or is it art – can it be both? Personally, I don’t believe that a building can be art – artistic yes, but not art. Art doesn’t have programming and it doesn’t have a required task to accomplish. If these houses could talk, what would they say to one another (hmmmm, another post maybe?) Are these next door neighbors going to get along when everything is completed? My guess is no. What do you think? 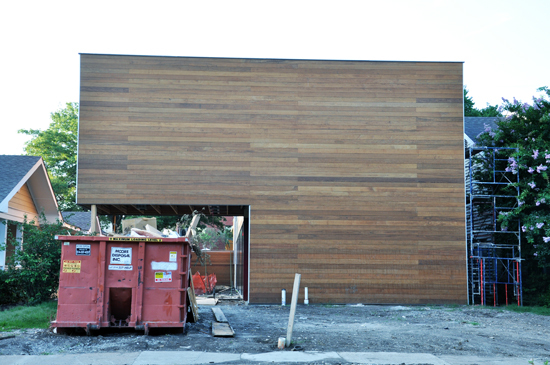 Cladding the forms in wood. In person you can see that the scale of the pieces that make up the screen in front help break the scale down from the overall mass. Offset the second level mass over the entryway. Not only did it provide some protection from the weather, it also helped break down the overall scale of the form. 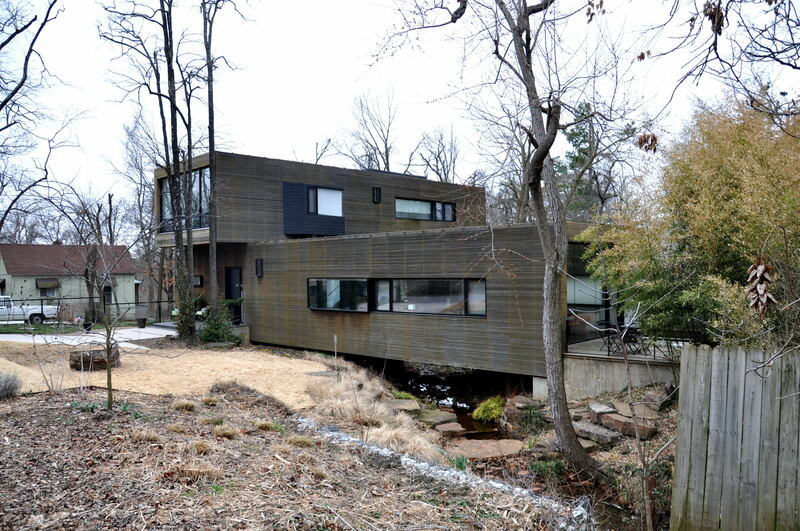 A site benefit was that there is negative typography to this site where the creek bed flows through the lot. And in an effort to make nice, they opened their home up during construction to everyone at all times. Understanding a thing goes a long way in appreciating it. There are other items that differ between these projects – most notably are the windows. These break down the box forms to human scale and allow the massing to be read as a collection of parts that contribute to a whole. I’m not against boxy residential project by any means, I even said that I would like to live in Marlon’s house (once he moved out of course), but the Russell’s project seems to be more about the message art as building and less about the building as art. In either case, the message the house is sending seems to be f**k you.